Back when I first started blogging (almost three years ago!) I bought and loved Arcana soaps. 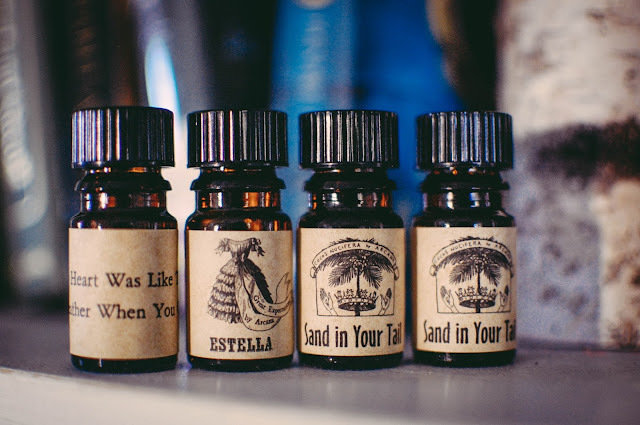 Julia, at Arcana Wildcraft, does not make soaps at the moment, I believe, but her perfume oils are incredible. She operates out of eBay and recently I shared a promotion she was hosting via my Facebook page. With a purchase of any 3 bottles (they run from $18-$20 each), a free bottle of My Heart Was Like The Weather When You Came (which was only available as a GWP and not for sale individually) was included. The notes on MHWLTWWYC pulled me right in, thus I made a qualifying purchase. 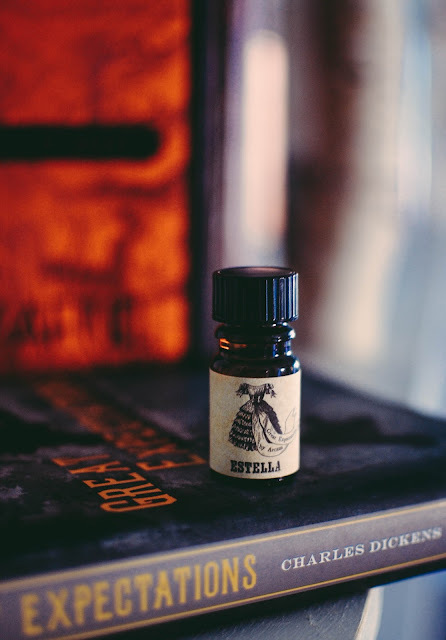 Estella- Notes: Ambre blanc, vanilla bean and cognac. From The Great Expectations release. 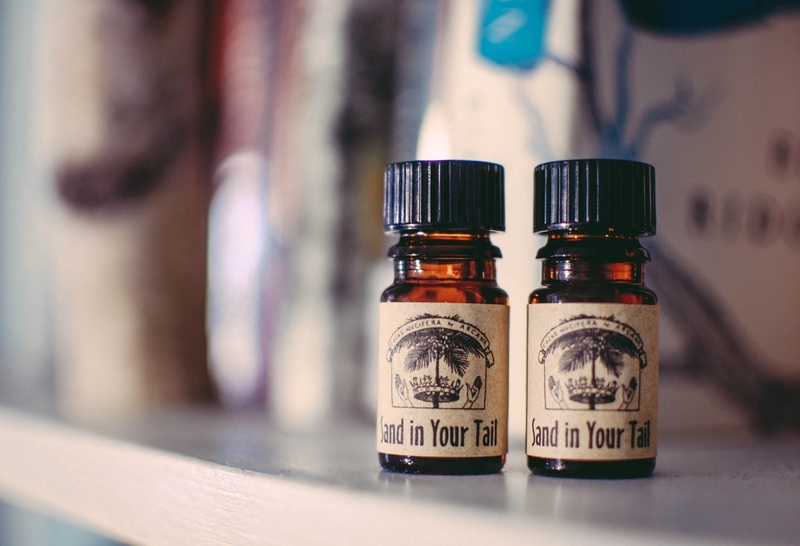 Sand In Your Tail- Notes: Musky black vanilla beans, sultry orange blossoms, smoky tree resin, ambergris, pink pepper, tabac, and rich incense. Now this one I have had before, in fact I owned a full bottle and reviewed it many, many moons ago. Wafting the glorious scent of the beach straight from the bottle reveals heady orange blossoms. Applied wet on the skin, orange blossoms and jasmine bloom warmly under a tropical sun, slightly peppery and hazy around the edges with musk and dappled with salty ocean mist. This phase reminds me strongly of vintage Coppertone sunscreen and wonderfully beachy aromas. As it dries down, the orange blossoms take on a wooden dryness and entwine with fresh Cuban tobacco leaves. 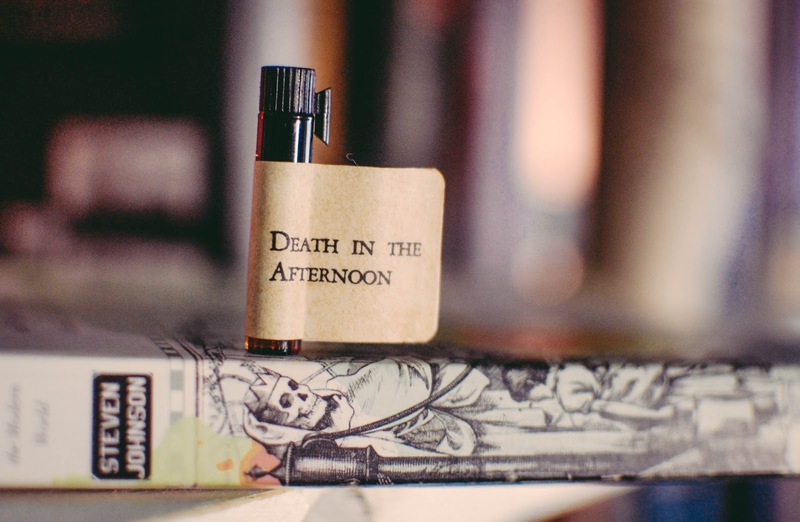 This perfume oil is incredibly lush and summery. If you are a beach scent lover at all this one you scratch that itch. And why two bottles? Am I being gluttonous? Nah. Not this time. I bought one to giveaway, of course! What better scent for a mermaid to bestow? Read on below to find out how to enter. 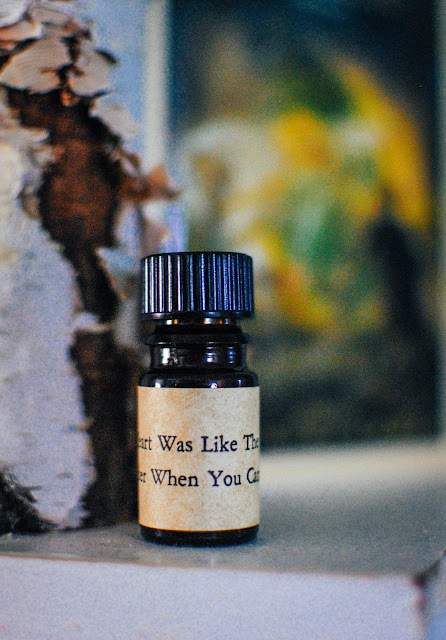 My Heart Was Like The Weather When You Came- Notes: Softly falling snowflakes with tender coconut husks, warm Brazilian tonka absolute, and a dab of sultry vanilla accord. So here she is... that beauty that was free with the purchase of the above three bottles, MHWLTWWYC. Right out of the vial, that coconut is sweet and and aged. It reminds me a lot of that expensive Haus of Gloi Coconut #3 that I bought two summers ago but a little more sweet. Freshly applied, the coconut flesh is fresh and creamy and dripping with vanilla nectar. It does have a coconut milk lacteal quality and mellowness. As it dries, the tonka beans shine, balmy and warm, brimming with woody vanilla tones. I am thrilled to have this sweet scent to wear this summer. I could see myself layering it with Sand In Your Tail. Death In The Afternoon- Notes: Absinthe, champagne, sugar, blood orange, tangerine, aniseed, and lemongrass. The Kraken- Notes: Smoked vanilla, black vanilla, saltwater, China musk, black musk. Upon smelling this one I immediately went back and bought a full bottle of it. Yep. Sure did. When I went back for The Kraken, I should have picked up Filthy Viking. I remember adoring that soap. I may have to do that here pretty soon. Obviously, I love my order. I am thrilled to have these new scents with which to usher in the summer and warmer weather. Keep in mind, if you do order perfume oils and are new to it, that they need to "rest" for a little bit before you can get a good sense of how they will smell or develop. 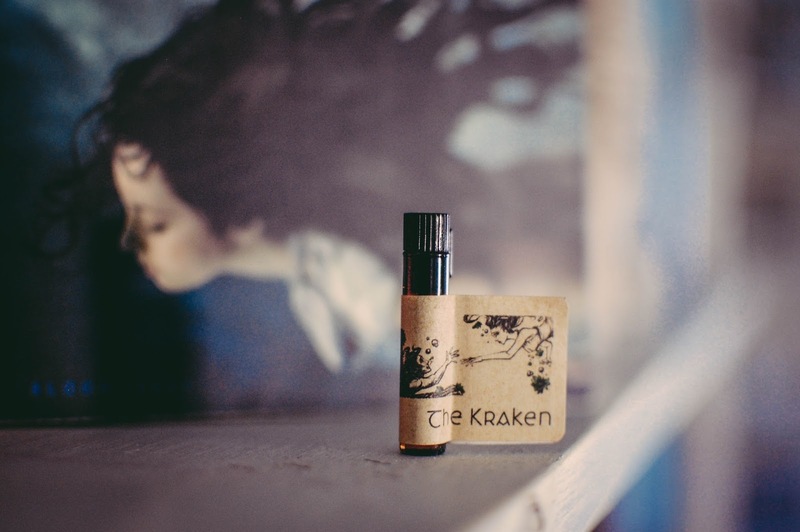 Travel, extreme temperatures and such can unsettle perfume oils. Also, unlike most alcohol based fragrances, perfume oils tend to only get better with age. As I mentioned previously, I am giving away the brand-new bottle of Arcana's Sand In Your Tail to one reader. The perfume oil will be accompanied by wax tarts and more than likely a sheet mask or two. To enter, please comment below with what indie vendor has been your favorite as of late (fragrance, bath and body or wax!). A random winner will be drawn on the Ides of March (ok, overly dramatic, that's March 15th folks). Hope your March has started out well! I feel like the Weather one hovers pretty close to the body, maybe half a foot projection but still about medium strength. I can smell it wafting about my body as I move my arms and it warms on my trunk. Sand in Your Tail and Estella have a stronger sillage. I think the orange blossoms really project nicely. Not overbearingly but still present and detectable in passing. Estella blooms wonderfully on the skin. But again, nothing like wearing Dior Poison or anything. But nice for an oil. I love SS oils too and am eyeing a few. I really need to invest in her Lavender Vanilla oil. I want to just drift off to sleep in it. What are your fave SS oils, Ellisa? The oils do have a wonderful longevity. I think this is because they tend to be in extrait form. I hope you have a nice week too! Adam is not feeling well but hoping he feels better by tomorrow. Or we will miss a concert I bought tickets to back at Christmas for him. Poor guy. Ad of late Sixteen92 has been my favorite. The seasonal scents are fantastic and I like the variety of products offered. Also, the shipping is very fast for an indie house. They do have a nice variety. That peppermint lotion and scrub combo looks amazing. Plus the EDP and oil scents are intriguing. I think I remember them selling wax at one point too. Fun! Thanks! Adrian... you won! Please send me your info by 3/16 midnight so I can send your package. Thank you! Yes! I love Black Forest too!! A delicious scent. Enjoy it! Have fun experimenting! As I am very intrigued by indie perfumes (all of your fault btw :p) I haven't taken the plunge yet because it is a little overwhelming with all the different fragrances and what will and wont blend well with your natural scent. When I do order I believe it will probably be with Solstice Scents and some of their earthy/sweet scents. A vendor I have rekindled my obsession with and have been enjoying recently is Super Tarts. Somehow my mind forgot how well their wax performs for my home. 2 orders are currently pending (bam bag and 1 clamshell order) so I am pumped for that of course! Another vendor I am excited about trying is this Mooscents, so I am keeping an eye out for a restock on her goodies. I agree, it can be. All I can recommend is to just sample away. Try on everything. But with oils it is real important to hold of sampling and sniffing until they have settled a little while after arriving to your home. Super Tarts has some great scents! Glad you are enjoying them. I tinkered with ordering a few but ended up holding off in the end. I think I will wait until ST next pre-order. That's great that you got to repurchase from an old favorite brand. The notes in those oils all sound amazing; thanks for the opportunity to try them. My favorite indie vendors are HoG for perfume oils, pumpkin butters and whipped soaps, Solstice Scents for perfume oils, Cocoa Pink for Body Butters, perfume oils and hair products, and I love the sprays and scrubs from The Scented Squirrel and also scrubs from Starry Skies and Candy Panda. I really want to try the new shaving soaps and body butters from Candy Panda too. Biding my time for now. I love Arcana! I have Surf but Sand in Your Tail sounds awesome! Me too! I will have to look out for Surf. As summer creeps closer I am looking at my perfumes and realizing I don't have many summery scents left. What are some of your favorite Arcana scents? My favorite indie is Moonalisa, I own most of the perfumes she's put out in the last few years. They are so complex and lovely and she does my favorite gourmands. I love many others as I'm a bit of an indie junkie but Moona is my first love. Thank you for the chance to win on the Ides of March which happens to be my birthday! Thank you for pointing my way to the Mystery Bags... I hope I am quick enough to get one. <3 And happy early birthday! I hope it is a fabulous one! I've been really loving cosmic cleanse recently, I haven't tried any of her wax yet but her body butter has an amazing and luxurious texture and just sinks into skin. The "we all float down here" scent is my favorite (fresh ocean, shaving cream, sea salt), really fresh and beachy. in indie perfume, I love olo fragrance. I've been wearing palo santo (PALO SANTO – SIAM WOOD – WHITE CHAMPA FLOWER) frequently lately, and I want to try wyeth (PINE RESIN – SALT WATER – MOSS) soon. ooooooo! Good to know! I am gearing up to place my first Cosmic Cleanse order during her pre-order very soon. We All Float Down Here will definitely be one of my choices. Sounds like a scent I would love. And the mints. I have never heard of Olo, I will look into them. I had to re-draw and my husband picked your number next. Please send me a message with your info and I will get this out to you on Monday! Thank you! Hello JS! Sent you a FB message. Please send me your info by Monday midnight. I love Crimson and Clover Apothecary. Her Nomad body butter makes me so happy! I love smellimg myself all day and my skin is so grateful. Thank you! Never heard of Crimson and Clover :-) I will check them out. I love Arcana! Her herfumes are so rich and long lasting. But to answer your question, Blooddrop is one that I've been loving as of late. They were on my radar for a while, but I only recently picked up a full sized perfume, and it's a new fave. These sound lovely, particularly Death In the Afternoon! I may have to make an order from this shop! My favorite recent purchases have been from The Mermaid And The Crow (MermaidandCrow on Etsy). She doesn't have many fragrances in her shop at the moment, although I did buy and absolutely love her limited edition Valentine's Day perfume oil. Right now it's mostly witchy drawing oils and candles and lovely hand made scarves she has in store. You might enjoy her stuff! I wore Death In The Afternoon to work the other day and a student hugged me and said I smelled really good. Sooooo... methinks that mean I need that one now too! LOL! The Mermaid and The Crow?! How can I not buy from this vendor? Thank you Stephanie! You sold me on the name and the candles. Hope you are doing well, friend. I've been really loving Solstice Scents lately, since I am working my way through a perfume oil sampler I received before Christmas. Thanks for the giveaway Julie! I agree, hot mama. Solstice Scents is really hitting the spot. There are a few I keep meaning to sample and buy. Maybe next month or so. Which ones are you loving from your sampler? Yesssss! Missing my Snowmint Mallow already. But your very very sweet gift of Blackburn is appreciated. I love this post, sounds like you got some great smelling goodies! Lately I've been loving Feather River Body for their fantastic eyeshadows, and Solstice Scents. As you know, they make incredible fragrances. I haven't tried anything outside of their fragrance oils, but I'm hoping to change that. Thanks for having this awesome giveaway! Oh, Cheryl! We need to change that! The bathing Garden is my current wax obsession too. I am so excited about my pending order(s). Good luck! My favorite vendors lately have been Future Primitive and Haus of Gloi. I overbought lotion last year so I've been trying very hard to stick to a no-buy while I use up what I have. I'm amazed at how well Haus of Gloi's pumpkin butter's retain their scent...even after two years! Two favorites of mine! That is good to know about the pumpkin butters. I have used all mine up (in fact I NEED lotion right now) but I do have one from TBG coming and I am eyeing one or two from Cosmic Cleanse to try out but in the end I am hoping for some nice summer pumpkin butters soon. Have you tried Britton's new line from Blood Moon Botanic? I am loving the Coconut Silk Butter right now. Have fun shopping your stash!